Another day of bird watching in Boise. I took in some cross country skiing this morning before heading out this afternoon to take some photos along the river. We were looking for bald eagles, but none were to be seen. We did see some interesting stuff. 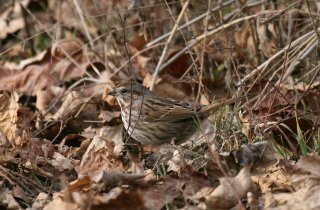 Here you see what I believe is a song sparrow. 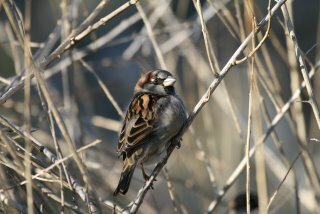 Sparrows are still tough for me. Not necessarily an exciting bird to find as they are quite common, but the picture came out quite good, so I though I would share. 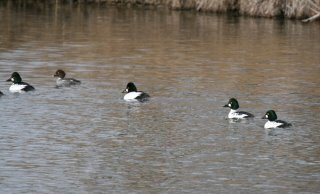 Upon approaching the river, I scared up a group of Common Goldeneyes (not necessarily common here, but that is their name). I had to sneak down the river to get this shot. One of my favorite birds chose to put on a show for us. 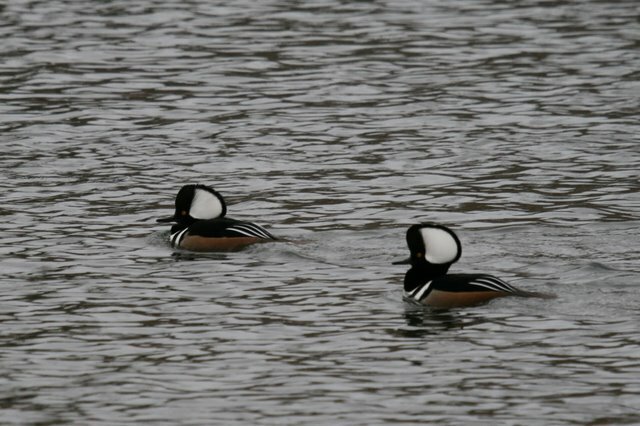 Here are a few Hooded Mergansers. I learned something today. Most of the head shape of these birds is made up of feathers. It surprised me when one of them folded down their head feathers. I had just assumed their head was shaped that way. On Christmas day, Karyn and I drove out to Wilson Ponds in Nampa for some bird watching and to get some more time using our joint Christmas present to each other - the 100-400mm lens for our camera (yes, we did cheat and use it for an earlier post as well!). A report that I had received a day before indicated a high level of bird activity at the ponds. 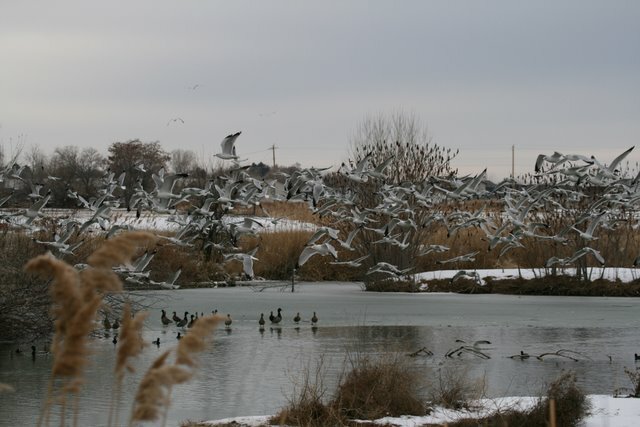 Contributing to the normal activity was the fact that the fish hatchery had released a number of fish into the ponds, causing a large increase in gull activity. Upon our arrival, there were birds everywhere. 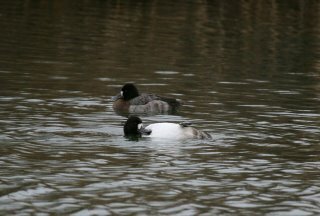 We originally the birds in the photo on the left might be Greater Scaups, but an earlier report of Lesser Scaups forced me to study the details more carefully. 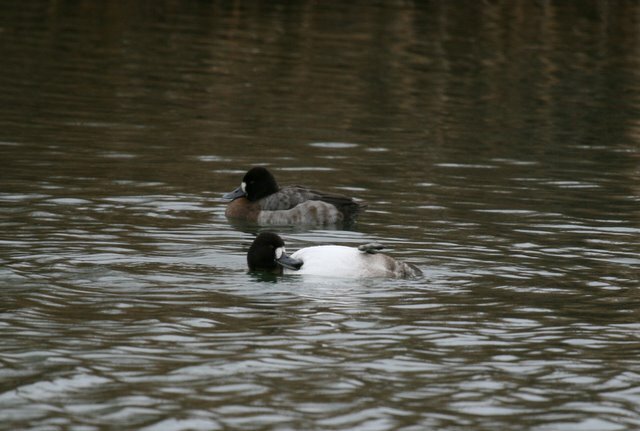 While not 100% sure, I now classify these as Lesser Scaups. As you can see in the picture on the right, there was a great deal of gull activity. I have identified a number of these as Ring-billed Gulls, but I am sure there are some others mixed in as well. We watched as the gulls would dive in for the fish. I watched one pull a fish out of the water, only to fumble it as tried to fly away. We watched a number of failed attempts as well. 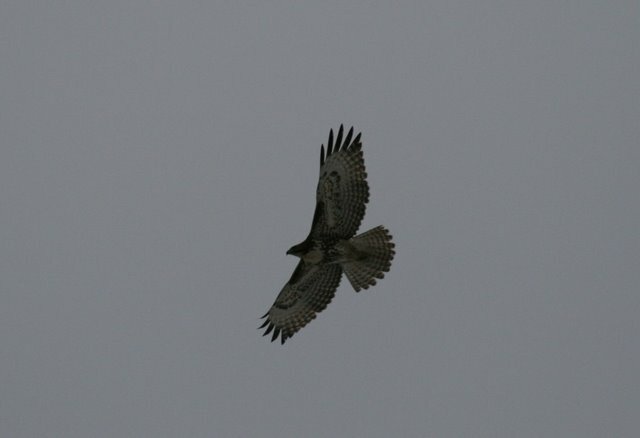 A Redtailed Hawk graced our presence for a while as it flew circles over head. 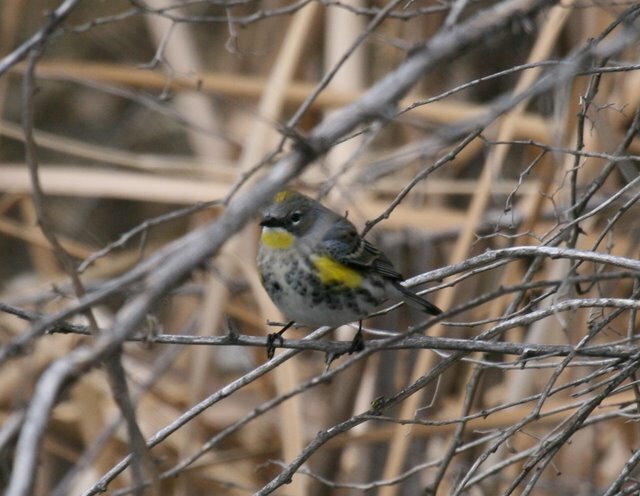 The surprise of the day, at least for me was a group of Yellow-rumped Warblers. I expected all warblers to have vacated the area months ago. A couple of our favorites - Belted Kingfisher and Pied-billed Grebe were also present. Arcticle feature in I and the Bird #40 blog carnival. 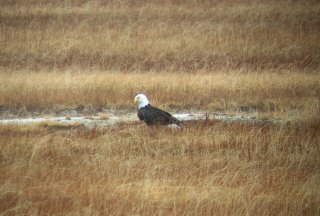 After years of digiscoping (taking digital photos through our spotting scope), we finally broke down and purchased a digital SLR camera for photography. We now use a Canon Digital Rebel XTi, with a Canon 100-400mm lens. It clearly doesn't qualify as a pocket camera! So far we have been very impressed with the image quality and even more impressed with the speed of the camera. The ability to take 28 shots in a row, 3 frames a second, is an excellent capability that we didn't have before. The focus is right on, even for motion shots. 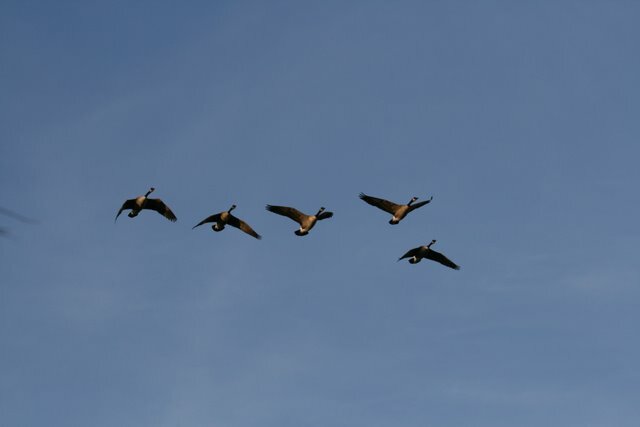 We have taken some good sequences of birds flying. 20 shots in a row, all of them excellent while panning. When buying the lens I was sure that we would have to tripod the camera to use it at all. Not true. 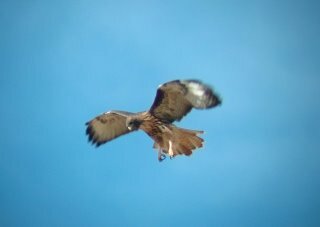 Most of the shots below were taken at 400mm hand held! It was definitely a good investment! I haven't published any posts on the election results in November. This is primarily due to my disbelief in Idaho moving more conservative as the rest of the country moved more towards the democrats. This shouldn't come as a surprise as our state has the second highest presidential approval rating, still above 50%. But that is not supposed to be the topic of this post. In a recent newsletter from the Coalition for Regional Public Transportation, a group which I have the honor of representing my company in, I learned of many successful ballot measures for public transportation across the country. Unfortunately, there weren't any in Idaho. Yet. Across the nation, $40 billion in new public transit funding was approved. Voters in 13 states approved 21 of the 33 ballot measures, including 7 statewide initiatives. This provides me hope for the future of the Treasure Valley of Idaho. As I have mentioned before in this blog, Idaho is one of only 4 states which provide no state funding for transit and restricts local funding of transit - Hawaii, Alaska, and Mississippi are the others. The coalition is working with the Idaho legislature to allow local option funding. This isn't an initiative to raise taxes, its an initiative to allow us to ask the citizens if they want to pay for public transit. Today in Idaho, we can't even do that. If we are successful in this legislature, in November 2008, we will get to vote to approve our own transportation system expansion. Today was an interesting transit day for me. The double Christmas Whammy hit. The bus service runs slower the week before Christmas as many bus routes converge on the mall. The traffic in and out of the mall, delays the buses through the day. 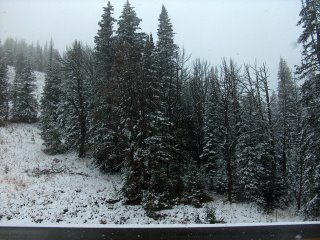 We were also hit with a mid-day snow storm. The result - I waited 35 minutes in the snow for my bus. Since the bus only runs once an hour, it greatly limit your options. Last week I traveled to Bangalore India on a business trip. It was a trip that I had put off for about a year, but it was finally time to go. I don't really like to travel. Upon scheduling the trip, I received no less than 8 warning email from our corporate travel department about the "high risk" nature of India. What did I get myself into? The trip preparation began with a visit to the travel nurse that was very successful in scaring the crap out of me. Shots, pills, water filters, emergency evacuation instructions, and instructions like "don't wear any jewelry or you will be robbed." It seemed as if I was stepping off the edge of the planet instead of visiting the world center for corporate IT. How could I travel on a packed 747 airplane to a city where my company employs over 20,000 people, and be at such high risk? In the end, I wasn't mugged or murdered, I didn't get food poisoning, I didn't get run over by a car or bus (this is amazing), and so far no signs of long term illness. Maybe it was the preparation, maybe it was over hyped risks, but I am not complaining. The trip was very worthwhile from a business perspective, but I want to highlight a few of the cultural observations. First, the traffic was absolutely fascinating. Complete chaos. I would not have survived behind the wheel for more than a minute. Red lights apparently do not mean you should stop, but instead that you should honk your horn as you drive through. Bikes, motorcycles, buses and cars going in every direction with no semblance of rules. I was sure that a bicycle I was watching was going to be wiped out. This repeated itself multiple times each day. The riders didn't even react to the dangers I saw so apparent. Another individual I was traveling with pointed out that if we were on bikes we would flinch and it would all be over. The system appears to work if no one flinches at the risk. One day I looked out the car window as a motorcycle rode by. A woman sat side saddle on the back and held an infant with one arm. The motorcycle edged between two buses taking what seemed to me as unbelievable risks. It dawned on me that in America the infant would have to be in a certified child seat until he or she weighed 60 pounds. Are the Indians incredibly bold, or are we incredibly wimpy and paranoid. Does this mentality play out in their culture and their world innovation? I don't know how it couldn't. The other observation I made was the divide between the accelerating high tech boom and those that are left behind. One block from our place of work, was a small vacant lot. On the lot there were hundreds of people. It was clear that they lived there with no shelter in the most cramped quarters I have ever witnessed. They looked hungry, in some cases starving. Children ran around naked. The lot stood out in sharp contrast to its surroundings. It opened my eyes to the fact that even in a location where hundreds of thousands of jobs are being insourced (outsourced from US and other countries), there are still those that are left behind. Interesting note: I only learned on my return trip that the city of Bangalore is planning to revert its name back to its historic Indian name of Bengalooru. Unemployment in 2002 = 7.6%, in 2006 = 5.4%. Food insecurity rate in 1996-98 = 14.2%, 2003-05 = 11.9% (USDA report). Last year the Republican dominated Idaho Legislature refused to consider the increase. Through some maneuvering the bill was provided an hour long discussion before being voted down in a landslide. It comes as no surprise that we are still the 8th hungriest state in the country. 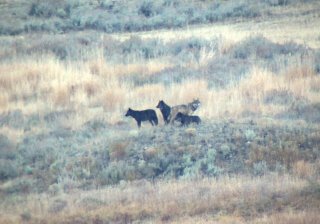 I have written before about trophic cascade, specifically the research regard wolves of Yellowstone. Trophic cascade refers to the situation where the lack of a keystone predator has cascading consequences through the ecosystem. These cascades can ultimately impact species we would normally think to be outside the realm of influence, but the connections are eventually made. A new study has been published regarding the lack of Cougars in Zion National Park. Here is the full press release: Cougar predation key to ecosystem health. 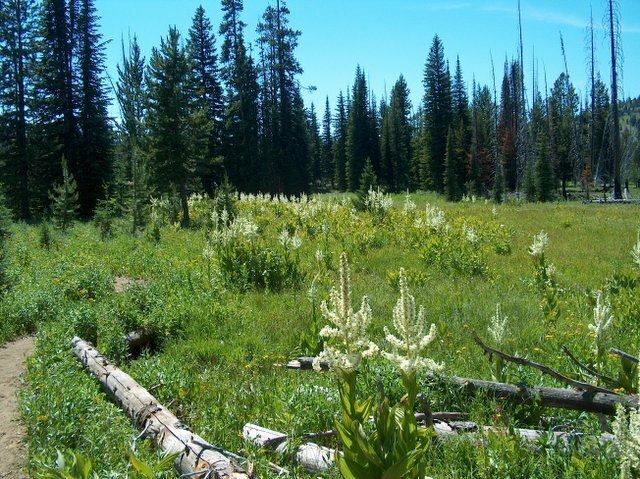 The cascade extends far beyond the direct connections with deer and cottonwoods (what deer eat), "It's the decline or disappearance of shrubs, wetland plants, amphibians, lizards, wildflowers, and even butterflies." All can be linked back to the lack of the keystone predator - Cougars. The challenge here is that it cannot be resolved by simply reintroducing cougars. Cougars have been chased away due to human activity. 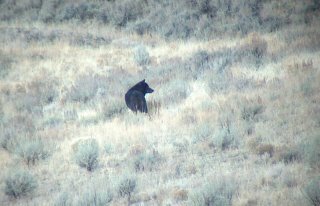 This is an important lesson on the importance of maintaining intact eco-systems with a full complement of wildlife. As human intrusions further segment the wild lands, I expect we will see much more of this. These local studies are only indicative of what has happened and continues to happen all over the planet. The World Wildlife Fund has recently released its latest Living Planet Report. This report covers two indexes, the first is the Living Planet Index. This index reflects the health of the planet’s ecosystems. 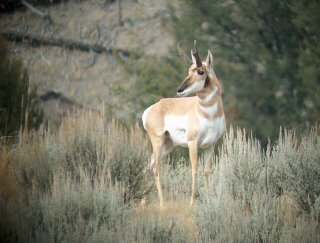 This index has fallen by 29% in the past 30 years, indicating a 29% reduction in populations of terrestrial, marine, and freshwater vertebrate species. The second index is the Ecological Footprint Index. This index indicates how much regenerative capacity is required to turn our waste back into resources. As of 2003, we are producing 25% more waste than the planet can possibly process. After many days of praying to the snow gods, we learned of a few ski areas grooming their nordic trails. Karyn and I headed out Sunday morning to Sun Valley in search of the white stuff. Driving up the Wood River valley, the bare mountains were a little discouraging. With each turn we would see a little more snow, primarily on the North facing slopes. Then a little more. Still concerned we arrived at a place called Prairie Creek to look out over the trail and see beautiful smooth grooming and full coverage. It was time to ski! We strapped on the "rock" skis and headed up the trail. The excitement of the first ski day, the beautiful outdoors, and the excellent track all contributed to the experience resulting in some awesome skiing. Surprisingly, my form was great. Definitely not typical of the first ski day of the season. I also felt great. It seemed like I was flying up the trail. What a blast! My destination was 12 kilometers up the valley past Galena lodge and up the North Wood river trail. I felt great the whole way there. The trail was fully covered and in great shape. At the turn around, I could start to feel the fatigue. About half way back to the van, I could tell that the fatigue was really settling in. The usual symptoms were present - dragging the ski on the snow, not as much follow through, shoulders roll forward, balance degrades, etc. 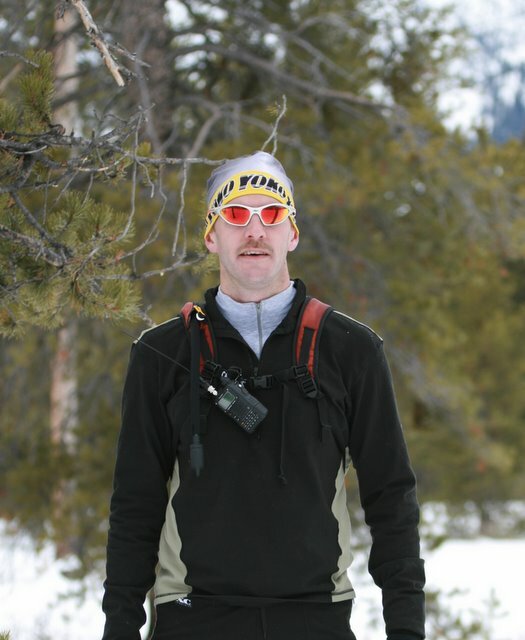 Skate skiing, like most finesse sports, is more difficult when you get tired. When you get fatigued, your form degrades, which makes it more difficult to propel forward, which makes you more fatigued. I slogged through the last few kilometers to finish hungry, tired, but in a good mood (at least after I ate some food). What a day! After eating lunch, the calories from the food and the endorphins from the effort combined to put us in a lazy melancholy mood for the rest of the day. It was a good afternoon for reading a book. For the second day, it was back to Prairie Creek. The day didn't start out quite as positive. Tired and sore from yesterday, it was a slow start, middle and finish. It was still great to be out there. We returned home for a few days rest before hitting the trails on the next trip. I just finished listening to E.O. Wilson's "The Future of Life" on my ipod. This book presents the case for urgent action to save the remaining environmental diversity of the planet. 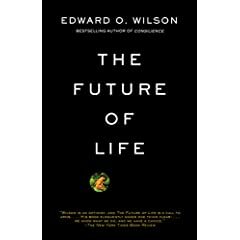 E. O. Wilson's unique witting style is entertaining (the introduction is written as a letter to Thoreau) and extremely compelling as he uses strong scientific examples to make his case. The book jumps around a fair amount and covers a wide range of topics, but that is part of what makes it so interesting. Wilson covers one topic which seems to be off limits for most writers. The second chapter of the book discusses the human population trends and how unsustainable it is for the planet. How most of the world, except the United States, is trying to address population growth issues. This is a topic that I spend a lot of time thinking about. I fully agree with a statement in the book that population control is the only chance the human race has to survive. Wilson spends a lot of time talking of species preservation. If you have read this blog for long then you know that species preservation is a particular interest area of mine. Wilson speaks of many species in their last grip of survival, of the extraordinary effort of scientists to keep their species alive. Efforts like we experienced in our EarthWatch trip - Saving the Leatherback Turtle. This refreshed some of my thoughts on species preservation. I absolutely believe that we should work as hard as we can to preserve species in natural habitat. The only way to accomplish this is to preserve enough natural ecosystems to sustain them. The limited work we did with the Leatherback turtles absolutely helped their survival, but it also interfered with natural selection, possibly damaging the species for ever. 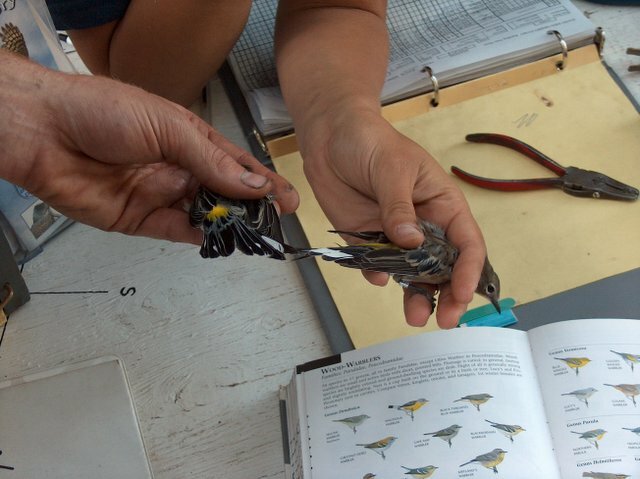 Some of the extraordinary measures that Wilson describe in the book are keeping some species from going extinct, but also interfering with natural selection. If this type of support is carried on for too long, then I postulate that the species will evolve to depend upon it. When is an artificially sustained species no longer considered the original species? But I digress. The book in an excellent, thought provoking work on species preservation. Unlike many of these books, E.O. Wilson finishes with a chapter of hope. He celebrates actions currently underway throughout the world. He proposes a way to step up the results. To put the cost in perspective, he states that huge accomplishments could be achieved for as little a 1 cent per cup of coffee consumed in the world. Think about that while drinking you next 4 dollar latte! and buy the book. I subscribe to Stoneyfield Farm's monthly newsletter. For those not familiar with Stoneyfield, they are an organic yogurt producer in the United States (Western?). This month, they linked to a very interesting report by The Organic Center analyzing the energy consumption of our food supply, specifically comparing Organic production with non-organic production. The report provided greater insight into the industry, and gives me one more reason to buy organic. You can access a 2 page summary here, or the full 40 page version here. The American food system uses 19% of the nation's total fossil energy use - 7% for production, 7% for processing/packaging, and 5% for distribution. It takes about 30% less energy to produce a bushel of organic corn, than a bushel of non-organic, although it requires 25% more labor. It takes 20% less energy to produce organic soybeans than conventional. The biggest difference is in nitrogen fertilizer consumption and pesticide use which is very dependent upon fossil fuels. Soil erosion was significantly reduced in organic production. Water resources were conserved in organic production. (organic farm yields were 30-50% higher in drought years than non-organic). An organic grass fed beef operation requires 50% less fossil energy than conventional grain-fed systems. It is a very interesting read. Karyn and I have converted to organic foods as much as possible. This was before knowing the above facts. I hope we can continue to improve our food supply, and decrease our energy consumption in the process. Seems like a win-win to me. I came across this article on the TreeHugger Blog about natural cemeteries. This is a topic that I think about occasionally, usually when I pass by a large cemetery. I think the Green Springs Natural Cemetery is a step in the right direction, but it falls short of what I would like to see in the world. In general, the burial processes in the United States are non-sustainable, hypocritical, and outright bizarre from a nature perspective. I am strongly opposed to displacing nature by creating a cemetery so that we as people can be preserved forever with toxic chemicals. We then hypocritically claim that by doing so we are returning to nature after death. My thoughts on the topic are first and foremost, that I do not believe I should consume land on this planet after I die. This planet should be available for life after I die, not for my remains. This is one place where the natural cemetery mentioned above falls short. The second issue is the embalming process. The specific injection of toxic chemicals into the ground. It is good to hear that this is an optional process. My Will instructions currently say that I wish to be cremated. This is considered the best alternative as it does not consume land, but does consume a great deal of energy and pollutes at the same time. My ideal would be to either be buried in a shallow grave naturally (no box) or just laid out on top of the land for nature to take its course. The biological processes are fairly efficient at cleaning up the waste and truly returning our bodies to nature. 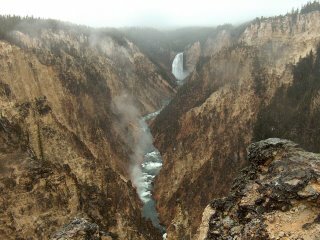 I have watched in Yellowstone National Park where a full sized bison is literally returned to the land in a period of 5-7 days, with nearly all traces gone within a month or two. Millions of animals die every day and this is the process that returns their nutrients to the planet, why not use it for us? In February of this year, I started this blog because I had a number of things to say. One of the first topics was about a controversial plan that the Idaho State Fish and Game Department had to kill 80% of the wolves in a particular area of Idaho (a total of 43 wolves in the Lolo Region). You can read my original post here which includes a link to the proposal and my comments against their plan. 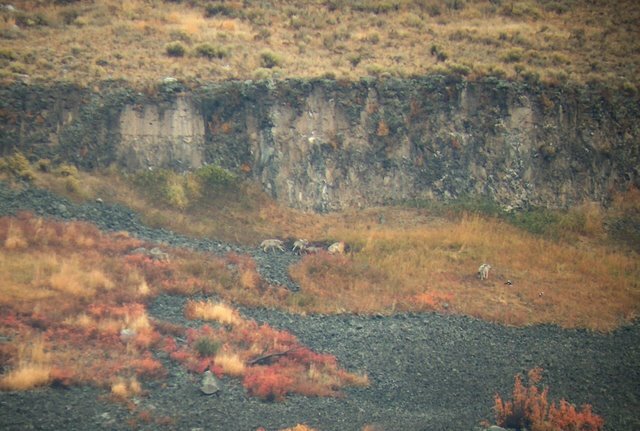 This plan was proposed just three days after the state took over management of wolves in Idaho. 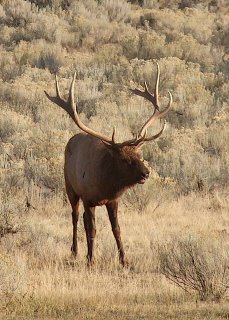 The plan was based on poor science, bad assumptions, and did nothing to address the real issue at hand - the fact that the Clearwater elk herd was in trouble through human actions long before wolves were reintroduced to Idaho. 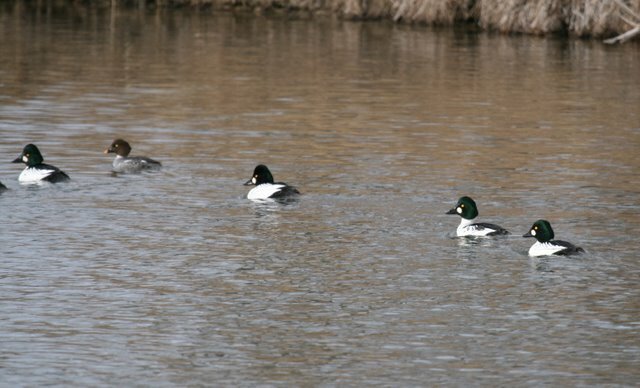 In March we received word that, after reviewing over 40,000 comments on the proposal, 99% against, the Fish and Game commission voted unanimously to continue anyway. My blog post is here. 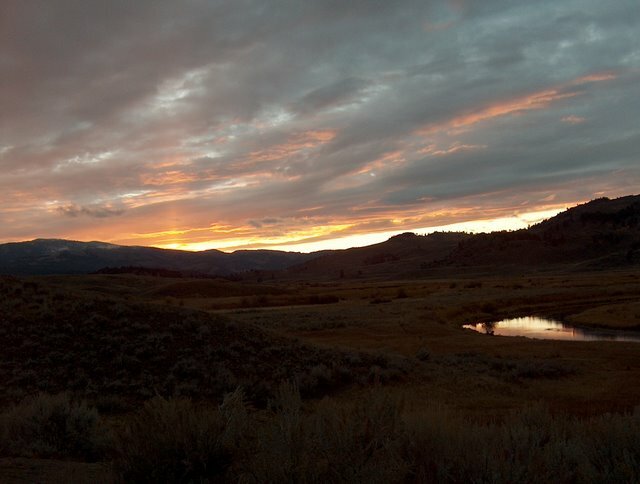 Well the news came out today that the Feds, also citing bad science, rejected Idaho's plan. 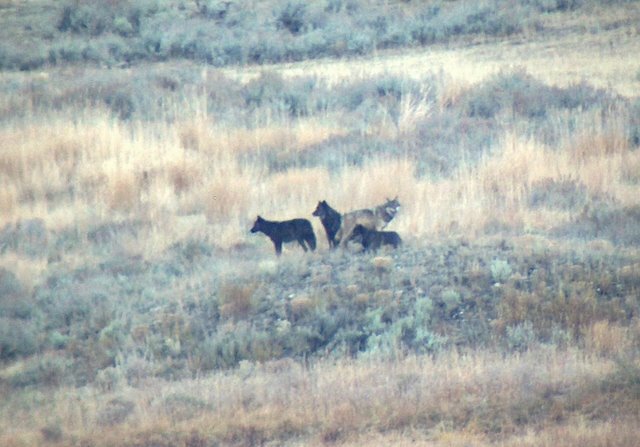 This is a tremendous victory for the wolves, the environment, the people of Idaho, and reasonable minds. It sets the expectation that wildlife should be managed by science not politics. Karyn and I returned from our labor day camping trip a day early so that we could visit the Idaho Bird Observatory on Monday morning. 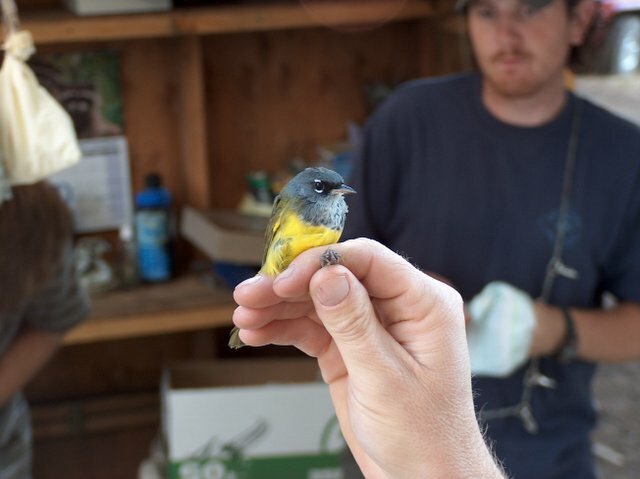 "The Idaho Bird Observatory (IBO) is a cooperative, non-profit research and education organization that conducts long-term monitoring of western migratory landbird populations and promotes public education, involvement, and wildlife viewing". We had conflicting information about what time we were supposed to be there. One item said sunrise and the other said 8am (about a hour later this time of year). Not knowing if we had to be precisely on time added to my over-obsession with being on time, we of course chose the earlier of the two. Our friend Julie decided to go along as well. The road to the observatory is a very steep road requiring a high clearance vehicle. The observatory is located on Lucky Peak (the mountain not the identically named reservoir in the bottom of the valley). We arrived in plenty of time to acquaint ourselves and head out on the first patrol. We found out that you don't have to be there at any particular time. The team begins work at sun up and works for 5 hours. The IBO project involves netting landbirds, weighing and measuring them, noting likely age, banding them, and then releasing them. All of the data is recorded for research and tracking purposes. The team has a series of eight vertical nets in the brush that catch the birds as they fly from bush to bush. Every 30 minutes the team will patrol the nets, removing any captured birds and placing them in cloth bags. 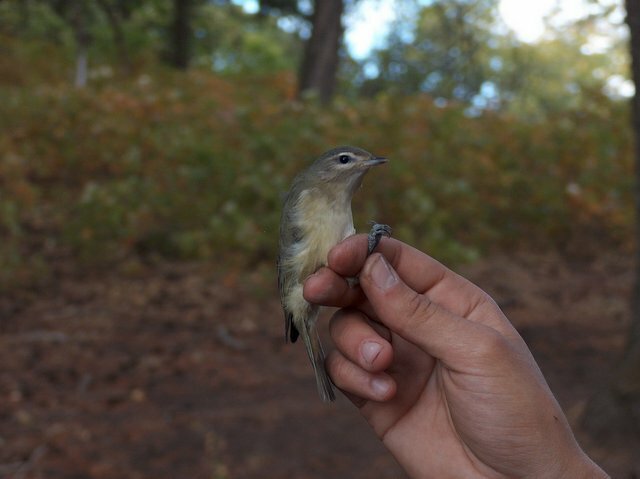 They then carry the birds back to the research station where all of the measurements are taken. As an observer you are free to go on the patrols, or just wait at the station until the staff returns with the captured birds. The staff was extremely helpful in answering questions and showing the process. They even let us release some of the birds. For the first hour and a half it was just the three of us and the staff, providing lots of interaction and learning opportunities. About 8:30, the local chapter of the Audubon society showed up, decreasing some of our direct interaction, but it was still very educational. We stayed until 11:30 before return to Boise. The list of birds banded while we were there: Hammond's Flycatcher, Dusky Flycatcher, Warbling-Vireo, Hermit Thrush, Red-breasted Nuthatch, Mountain Chickadee, Fox Sparrow, White-crowned Sparrow, Dark-eyed Junco, Spotted Towhee, Orange-crowned Warbler, Nashville Warbler, Yellow-rumped Warbler, Townsend's Warbler, MacGillivray's Warbler, Wilson's Warbler, Western Tanager, and Lazuli Bunting. Overall the experience was very educational from a bird biology, bird identification, and migration perspective. It was fascinating to see the birds up close and observe subtle differences that I would never notice in the field. The staff was extremely helpful in answering questions and providing their insight and perspective. While our entire experience was positive, I couldn't help but get the uncomfortable feeling that we were being too disruptive to nature. The staff took every measure possible to ensure the safety of the birds, yet they were being captured in nets and handled by people. This is the same feeling I get about wolves being collared and leatherback turtles being harnessed. I understand it is necessary for us to help the species as a whole, but it is still obtrusive to the individual. I dream of a day when this is not necessary. All in all, I would definitely recommend this experience to others and I plan to participate again myself. The IBO also has a hawk watch program which is just ramping up for the fall and an owl watch program. We hope to participate in these as well. 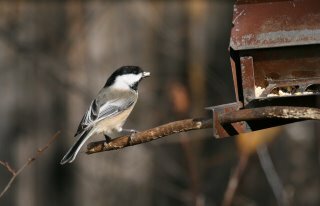 A very creative version of the "I and the Bird" blog carnival has just been posted on migrateblog. Mariya creatively writes a Haiku for each and every post. 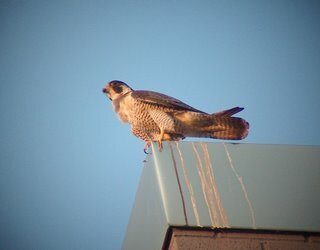 My post below on Peregrine's in Boise is featured in this edition. Read them all, and the articles they reference at migrateblog. On Monday morning I walked downtown to catch the bus to work. I took the usual route walking 15 minutes down to the coffee shop, enjoying my coffee for a few minutes before walking to catch the bus. 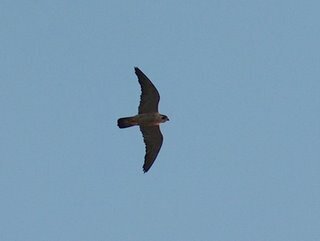 As I stepped out of the coffee shop I heard the loud screeching of a juvenile Peregrine Falcon. At least I assumed it was a Peregrine. Dialing up the sound of the Peregrine on my Birdpod (Birdpod is a product that loads all of the bird sounds for your region onto your ipod), I confirmed the identity. 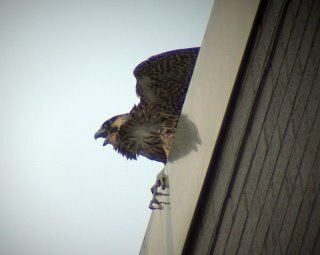 Walking down the street, I saw three Peregrines fly overhead about three stories up. The third in the line was screeching non-stop. I watched them fly in and out between building until it was time for my bus to leave. 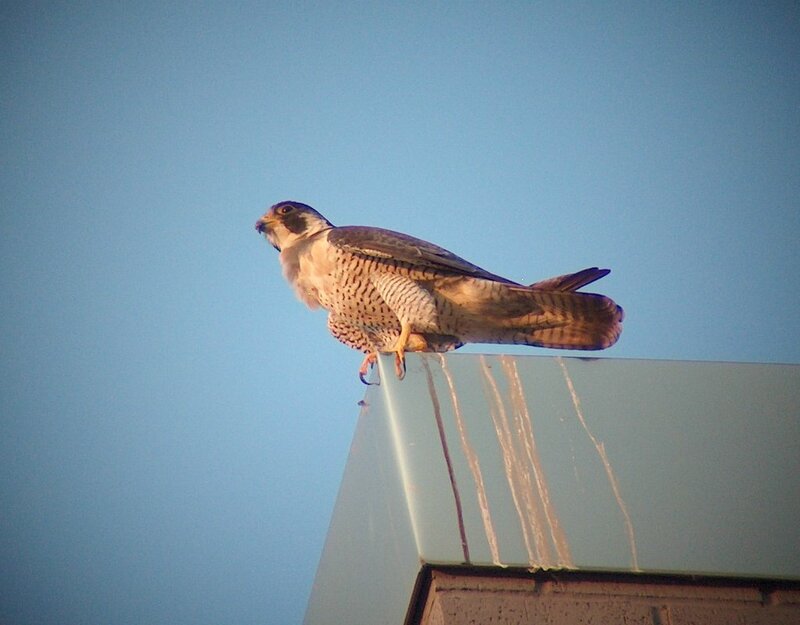 I have heard that we had Peregrine's nesting downtown for the last few years but, I haven't ever seen them. This week it has been hard to miss them. 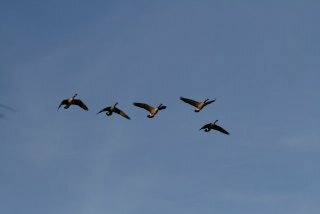 They flew around for 20 minutes or more before flying out of sight. We waited a while, but they did not come back. Karyn joined me this morning on my walk to the bus to watch the show. The three Peregrine's flew in to a perch and waited there until my bus left. 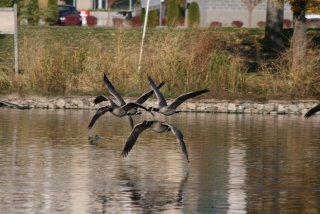 A short while later, they put on a good flying show for Karyn. I plan to work on some better photos in the next few days. This article is featured in the I and the Bird #31 blog carnival. Is every species of living thing on the planet equally deserving of protection? The people over at ScienceBlogs have a feature called, "Ask a Science Blogger". This feature poses a weekly question to the scientists hosting their blog on the ScienceBlogs site. In some cases the questions are submitted by readers, submit your question here. Some or all of the members then post their response on their respective blogs. You can view the full archive here. In July, a particularly interesting question was posed that I would like to answer - Is every species of living thing on the planet equally deserving of protection? Lots of different potential answers come to mind - yes, no, everything except for mosquitoes, etc. After deep consideration, I have come to the conclusion that no, not every species is equally deserving of protection. I will explain my rationale here. First of all, my personal value around species preservation deals with natural ecosystems. I believe that the best chance that all life has on this planet, including human life, occurs in the presence of strong, natural, balanced ecosystems. These balanced ecosystems help to maintain healthy and ever evolving populations of species. The absence of critical ecosystem participants causes the natural balance to be disrupted. This lack of balance usually allows some species to over populate, providing unfair advantage over other species. The disadvantaged species are reduced or eliminated, causing a further cascade through the ecosystem. While the over-populated species have a short term advantage, they quickly suffer from their own success. By eliminating or at least decreasing their food source, many will starve, but more importantly, the chance for further evolutionary species growth will be inhibited (my personal theory, I have not read any studies to this effect). This limitation in further evolutionary growth can mean the end of that species. This results in further cascades through the ecosystem. The elimination of a minor species from a balanced ecosystem can set off a chain of events resulting in a complete collapse of species diversity. 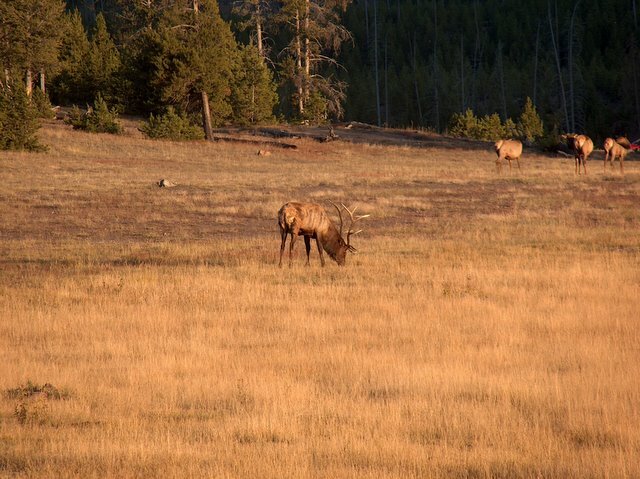 In evolving research, it is becoming apparent that the elimination of wolves in Yellowstone in the early 1900 allowed the elk population to grow uncontrolled. The elk quickly ate the willows and cottonwoods growing near the rivers. The reduction of willow and cottonwood trees caused a dramatic reduction of beaver colonies. The lack of beaver colonies reduced the habitat for native trout species. The chain goes on. The over populated elk also contracted diseases which were spread by sick animals which would survive longer in the absence of wolves, spreading the disease to more elk. 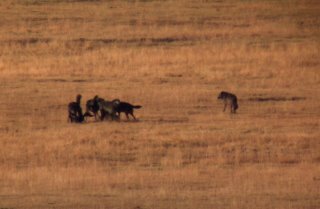 The elimination of wolves also allowed the coyote population to grow uncontrolled as wolves and coyotes compete for territory. The over population of coyotes resulted in the reduction of ground squirrels and other food sources. The coyote population then became diseased as well, with a pup survival rate of less than 10%. All of these changes, and many more, were the result of the elimination of a single species - the wolf. On the contrary, evolution occasionally produces dead end species. Species have regularly gone extinct over the history of life on this planet. I do not believe that these species should be preserved beyond their natural existence. Thus, the real challenge is for humans to determine which species are being threatened by our own over-population and which species are being threatened by purely natural processes. I don't have much confidence in our current ability to make these determinations. In conclusion, I don't think all species are equally deserving of protection. Specifically we should not be protecting species which are being naturally removed from the ecosystem through evolutionary dead-ends. Since many more species are threatened than I believe are naturally evolutionary dead-ends, and we do not have the current ability to completely evaluate a single species role in a healthy ecosystem, I believe we should error on the side of over protection. In practice, this means that we should work to protect all species. About six months ago I sent an email to the mayor and city council of Boise Idaho urging them to sign onto the U.S. Mayor's Climate Protection Agreement. Since I never heard back I concluded that it was another futile attempt to convince politicians to save our city from unhealthy growth and unhealthy industries. Much to my surprise today, the news came out that Mayor Dave Bieter signed the agreement. I believe this is a huge step forward for Boise and gives me hope for a city which is experiencing dramatic increases in polution (we entered our first ever red air quality alert yesterday). While I doubt that my message six months ago had any direct effect, it does provide me some encouragement to continue to try and influence our community in a better direction. Back on July 24th, Karyn and I attended the City Club of Boise luncheon on global warming titled "Rocky Mountain High: Global Warming in the West". The session was very interesting and very well attended. Here is a brief summary of the highlights. Dr. Fagre started by presenting some very sobering statistics. For example, in 1910 there were 150 glaciers in Glacier National Park, today there are only 27; Red Eagle glacier has lost 50% of its mass in the past 5 years; Sperry Glacier had 60% more snow than last year, yet melted down 20% faster. Dr. Fagre discussed how glaciers and mountain snowpack are important for our cities. Across the world, 50% of our fresh water is provided by mountains. In the western United States the range is closer to 70-90%. What we are seeing in some cases is greater snow fall, but faster run off, leaving less water throughout the year. In those years with less snow fall, the run off is even quicker. This presents a large threat to our cities. The doctor then presented a number of ecosystem ramifications of this warming. Much of the focus of global warming has been on the high temperature, but most of the issues arise in a higher low temperature and shorter winter. The warmer winter temperatures are allowing the snow to partially melt and refreeze, creating a impenetrable barrier for mountain goats and other animals to break through to the food below. This is causing many animals to starve. 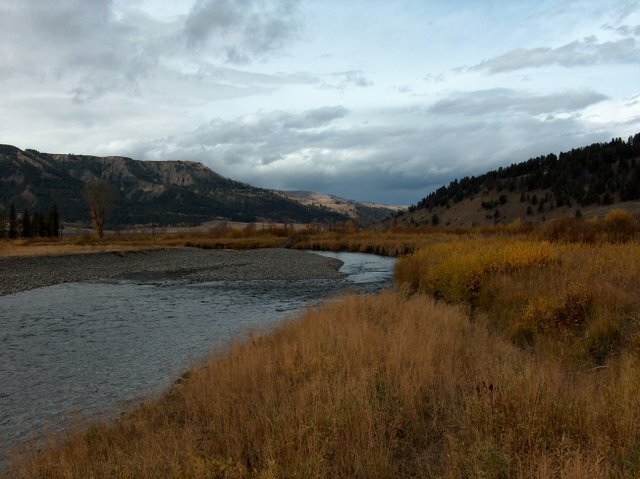 Higher stream temperatures are killing off small aquatic insects, an important food for trout. 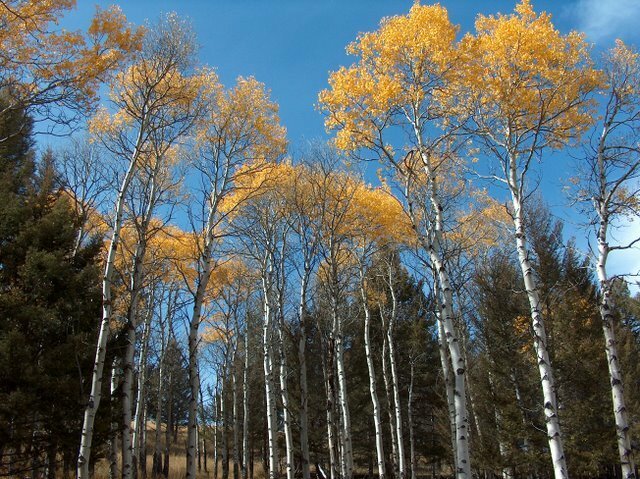 Trees are invading high alpine meadows, further limiting the food sources for the animals that live in that area. Dr. Fagre showed a photo of Hidden Lake from this early 1900's and one from today. It was amazing how much of the alpine meadow has become forested. During the question and answer period, someone asked if this is not a natural warming. Dr. Fagre indicated that people are accelerating and intensifying what might have been a natural warming process. The warming has been slower than expected as the oceans have been absorbing the CO2. Unfortunately the oceans are slowing their absorption as we are accelerating our CO2 output. There is a self correcting mechanism, but it has disastrous consequences for life. The build up of CO2 will warm the planet until the ocean currents stop, at which point the next ice age will begin. When asked if he had ever been censored by the government, Dr. Fagre said no. When asked about the uncertainty of global warming, Dr. Fagre pointed to a recent study of 1000 scientific articles. They were 99.9% consistent that global warming is real and so is the human impact on it. Media articles were only 50% consistent. Dr. Fagre had three suggestions for us: 1) limit the damage (reduce, eliminate, reverse), 2)Take CO2 out of the system (increase vegetation, sequester CO2), 3) Build resiliency. It was a fascinating presentation. Unfortunately it was way too short. Whenever possible Karyn and I chose organic food products over non-organic. I realize most of these food products are developed by large industrial organic entities in non-sustainable ways. While there may not be a significant increase the nutritious values of these products, I still believe there is a value in the decreased chemicals both on me as an individual and the environment. We also try to take that one step further by purchasing local organic and non-organic products that are produced by smaller farms, as I truly believe that they are healthier for me and teh environment. We purchase some of our meat from a company called Daily Blessings. They alerted me to the changes proposed below. I was upset a few years ago when the federal government relaxed the organic standards to enable more large producers to market under teh "organic" label. It would appear that they are up to it again. I will be writing my letter, I encourage you to do the same. Increased demand and limited supply of organic beef has led many to consider alternatives that would lead to increased production. The USDA Agricultural Marketing Service is considering expanding the list of allowable substances that can be used in treating livestock, while still remaining eligible for organic certification. Bismuth subsalicyate, an anti-diarrheal drug also used by humans. Butorphanol, a short-acting painkiller often used before surgery. Flunixin, a non-steroidal, non-narcotic treatment for inflammation or pyrexia. Furosemide, a diuretic used to treat pulmonary and udder edema. Magnesium hydroxide, a naturally-occurring mineral used as a laxative and antacid. Peroxyacetic/paracetic acid, used to sanitize facility and processing equipment and as a topical disinfectant on animals and meat and dairy products. Poloxalene, a synthetic substance used to prevent or treat bloating in cattle and as a stool softener. The National Organic Standards Board (NOSB) and the USDA disagreed about the appropriate circumstances under which some of these substances should be used, and for how long. The NOSB recommended a withdrawal period twice as long as the FDA guidelines for butophanol and flunixin, and asked for an extended withdrawal period on furosemide as well. In addition, the NOSB recommended that poloxalene should only be used in emergency circumstances, while the USDA wanted it to be available as a preventative treatment. 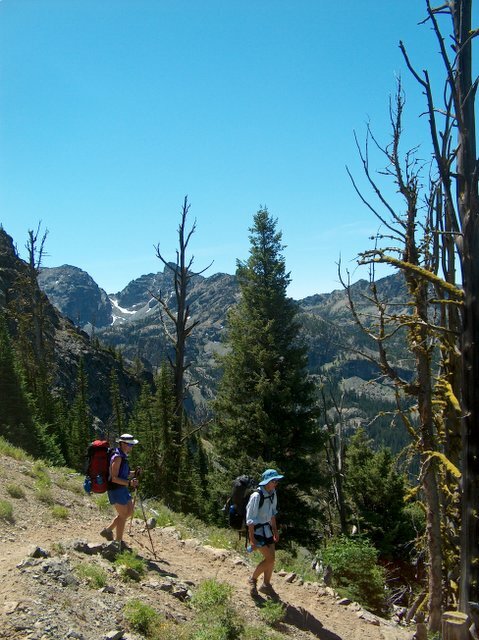 This past weekend, Doug, Lanette, Karyn and I backpacked into the Seven Devils Mountains in West Central Idaho. The seven Devils mountains form the Idaho side of Hell's Canyon. They consist of seven peaks with various devil names, hence the name of the mountain range. I believe the official peak names are She Devil, He Devil, Tower of Babal, The Ogre, The Goblin, Mt Belial, and Devils Throne. There is also Devil's Tooth and the Twin Imps identified on the map. The trailhead starts out quite high at a place called Windy Saddle, 7600 feet above sea level. We start by heading downhill! The hike from the trailhead to our camping destination was 8 miles. The trail passes through a few drainages, essential gaining and losing 2600 feet to arrive at our camp at Gem lake, 7800 feet above sea level. In the picture at left you can see Karyn following Lanette around a switchback. She Devil is the rounded peak in the background, He Devil is just right of it hidden behind the dead tree. 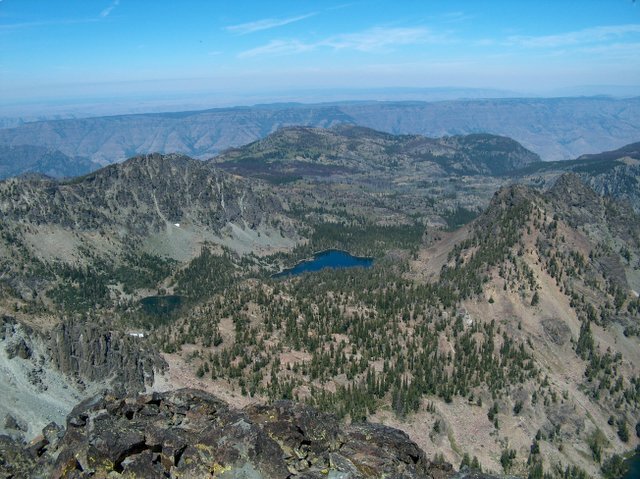 It was an interesting hike, providing beautiful vistas of the Seven Devils mountains and the Wallowa mountains far in the distance (the other side of Hell's Canyon). We found a dead pack Lama that had been in the heat for about a week (not a highlight). Not sure how it died. On a more positive side, we found a live Spruce Grouse with three chicks. About 6 miles into the hike we climbed up onto a high ridge. The ridge provided some unique geology. High flat meadows (shown at the left) with a shallow lilypad lake. Getting a little tired from the hike, at about 7 miles we stopped at Basin Lake to get some fresh water. Continuing past Shelf lake to our destination, Gem Lake. We found a great campsite near the outlet of the lake. There was one group of campers at the lake already. That night it stayed very warm. Daytime tempuratures at this elevation were near 90 degrees (over 100 down in the valley). The low tempurature might have gotten down into the 60s, but not very far. On Saturday, Doug and I headed off to climb She Devil. The book said it would be an easy ascent, so we didn't bother to read the details nor bring the route instructions. If there was an easy route up, how hard could it be to find? We first hiked up and over the saddle to Sheep Lake. This was an even more beautiful lake than the others, but did have more bugs and two other camps. We picked a route to head straight up a loose scree field. Not my favorite. About a third of the way up, I suggested that we move over to the hard rock face of the mountain. This route provided firm hand and foot holds that I much preferred. We did worry about the descent as this was steep enough it would be very slow going on the way down. We made good progress and reached the top in about an hour and a half from Sheep Lake. The lake you see in the photo on the right is Gem Lake, where we were camped. The ridge in the lower right sits between Gem and Sheep Lake. 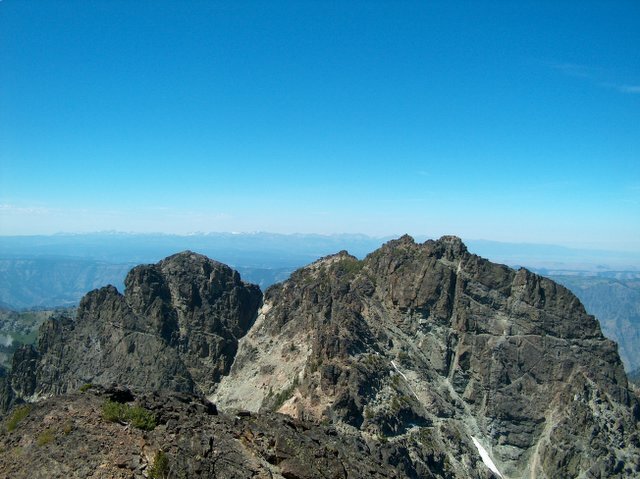 The picture on the left is of He Devil mountain from the top of She Devil. Due to a very large number of flying ants at the top of the mountain, we didn't stay long. What they were doing there, I have no idea. We chose the quicker route down the scree field for the descent. The top of the field consisted of very small gravel that made for quick and easy sliding. The gravel slowly increased in size, slowing our progress. We reached Sheep lake in about an hour. Up and over the saddle and back to camp in another 45 minutes. It was an excellent hike, but I was tired and sore. Spent the rest of the day eating, drinking, laying around, and enjoying the outdoors. On Sunday we hiked out. Enjoying the lighter pack, we made great time. In one old burn area we found a Hairy Woodpecker, some Northern Flickers, and what we think were Lazuli Buntings or Indigo Buntings (still researching). The drive down from the trailhead was depressing as we entered the 107 degree heat. We decided to go jump in the Salmon River before stopping for dinner. There was a moose in a small inlet off the river right next to the parking area. Keeping an eye on him, we jumped in the cool water. An excellent trip.